-Coat bottom of skillet with oil. -Saute veggies until soft, about 10 minutes, on medium heat, stirring occasionally. -Add spices to the veggies, stir to coat, and cook one minute longer. -Transfer the entire mixture to a slow cooker. 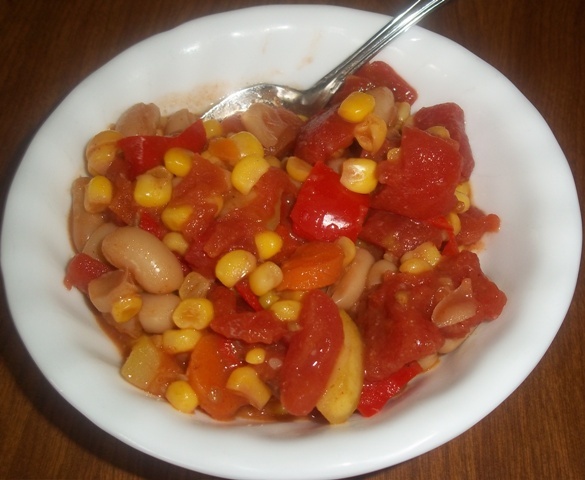 -Add the tomatoes and cooked beans, and stir. -Cook on low heat for 3 to 6 hours. Serves 6 to 8. (Save for another meal or freeze one meal size portion for another day). A yummy complement to this soup would be No Knead Bread. Total cost for the soup = 5.77; if you serve 8, that is .72 per serving or $2.88 for 4. The bread will cost roughly $1.30 now, and will also make 8 servings; that is .16 per serving, or .65 for 4. The soup with bread is $3.53 for a family of 4, assuming you buy your ingredients on sale. I shared this post at $5 Dinners. Looks good! Not sure I could convince my kids to go meatless with the chill though!